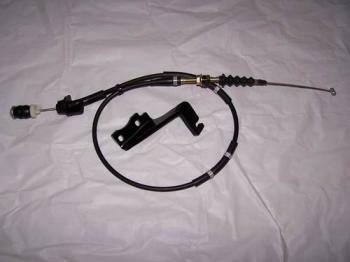 K-Tuned Throttle Cable - Dezod Motorsports Inc - Home of the automotive performance enthusiast since 2002. Tired of having a throttle cable long enough you could dry your laundry on it? K-Tuned has developed a custom throttle cable bracket and matching properly sized cable. No more long throttle cable all over the engine bay, this one is just long enough to reach the firewall with no wasted length and just enough slack. The cable is a perfectly sized OEM quality cable designed specifically for K-swaps. The bracket is anodized/powder coated black and is designed to fit on all OEM K20A2/Z1 throttle bodies. This kit DOES NOT work with K20A (JDM ITR) or BDL Performance throttle bodies. It is designed to fit North American K20A2/Z1 throttle bodies only. Designed to be used with K20A2/Z1 throttle bodies. Properly sized OEM quality throttle cable. Custom CNC machined steel throttle bracket. Clean looks and easy to install.